I noticed. Yet, later "revelation" disagrees with the BoM. So, which should Mormons believe? The BoM? The D and C? The Pearl books? The Bible? I already have discerned that they tend to hold the Bible in lower esteem than the other three. Sad. So, you think we ought to toss the Bible in favor of the BoM? Some Mormons on here have stated that they do not believe the BoM is perfect, but could contain mistales. You guys can say what you like; the Book of Mormon is canonized LDS scripture; and everything taught in the Book of Mormon is Mormon doctrine. That applies equally to all the other canonized scripture of the Church. It is Mormon doctrine? Even the verses where they say that the Father, Son, and Holy Ghost are "One God"? And where it says there is NO OTHER GOD? How about the verses where God says that it was an abomination to him when David and Solomon multiplied wives unto themselves? Is that doctrine, too? Is the BoM without errors? Everything in the Book of Mormon is Mormon doctrine. Doctrinally and theologically speaking, yes. It doesn't mean there are no spelling mistakes in it, or printers mistakes, or copying errors. You did no such thing. The Book of Mormon is canonized LDS scripture, period. That speaks for itself. You can knock your head against that wall until all your brains fall out, it will not alter that fact. That is a contradiction in terms. It is a self-contradictory statement. It is like saying, "you don't believe what you believe". The Book of Mormon IS the scriptural canon of Mormonism. It is what the LDS Church BELIEVES. It is a STATEMENT OF BELIEF of Mormonism. It is the WORD OF GOD as far as Mormonism is concerned, and CANONIZED LDS SCRIPTURE. You can't have anything that is more "official" or "authoritative" than that. The LDS Church determines what it believes. Everybody determines for themselves what they believe. You don't determine for anybody what they believe. You ask them what they believe, and they tell you. You don't tell them what they believe. Interesting...Heleman 5 even says Jesus is the foundation and that they should build upon Him. "It is upon the Rock of our Redeemer, who is Christ, the Son of God, that ye must build your foundation...' Obviously suggested by the Matthew verse, where Jesus says 'upon this Rock i will build My church and the gates of Hades will not prevail against it." 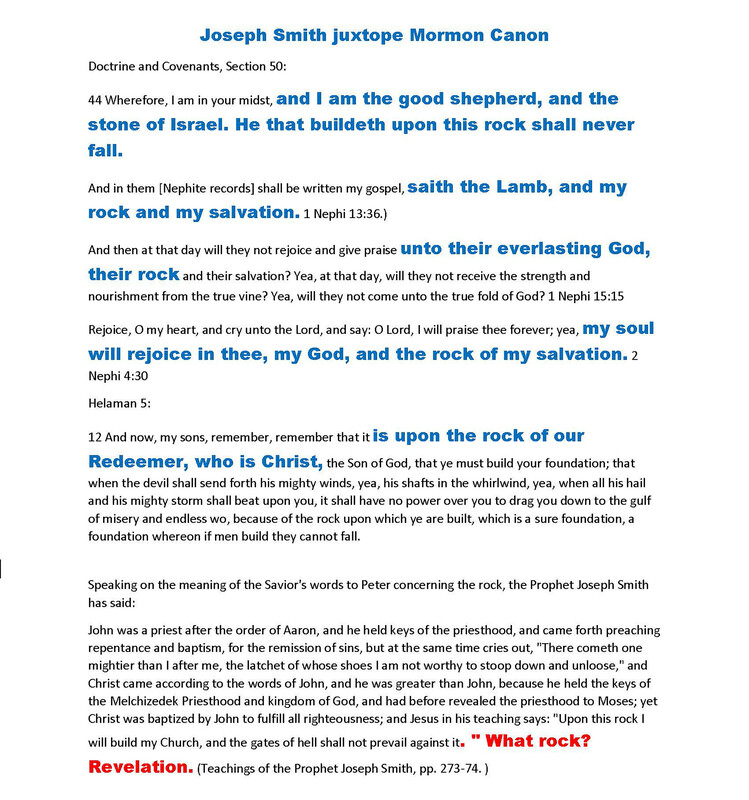 Yet--of THIS verse, I have seen Mormons on here said this "Rock' is REVELATION--that Jesus will build His church on REVELATION. Which is what JS taught later on. Thus, once again, contradicting himself. No wonder the LDS church has to twist itself into a theological pretzel, to try to get around all of the contradictions!